Make your Android app feel at home on any device. 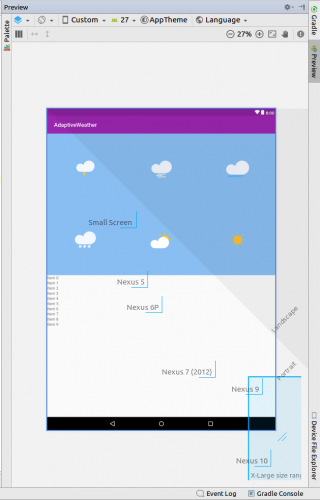 Learn how to build an adaptive UI that looks and works well across all devices and screen sizes. 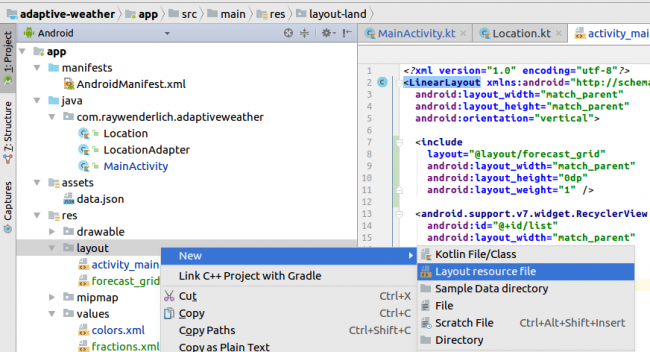 Update Note: This tutorial is now up to date with the latest version of Android Studio version 3.0.1, and uses Kotlin for app development. Update by Joe Howard. Original tutorial by James Nocentini. 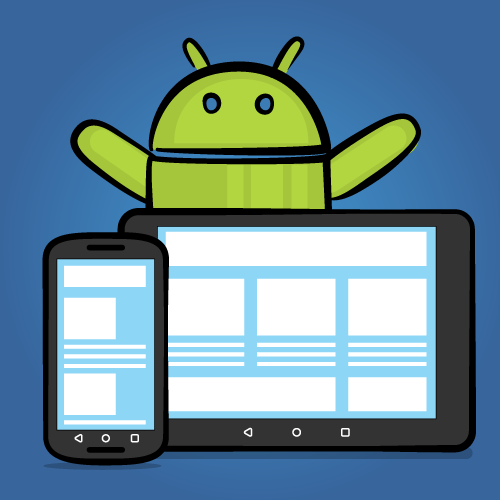 Android runs on a wide variety of devices that offer different screen sizes and densities. Because of this, it is important for Android apps to have a responsive user interface that can adapt to these different screens. 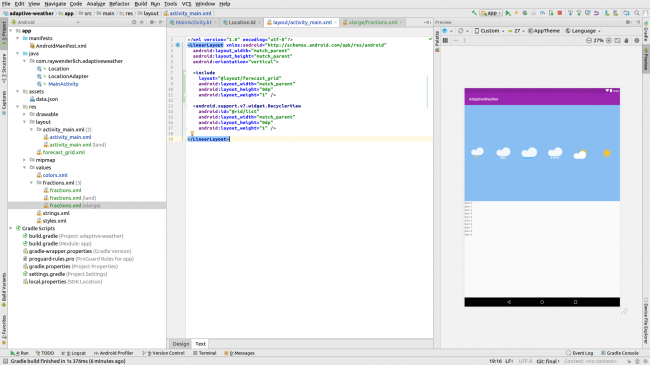 Since the early days of the Android platform, system APIs have provided very powerful abstractions to design adaptive UIs, also known as adaptive layouts. 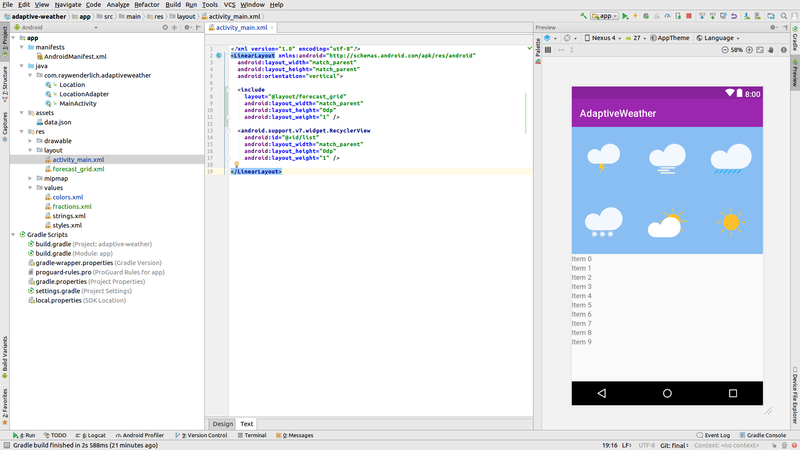 Download the starter project named Adaptive Weather here, and open it in Android Studio 3.0.1 or later. Then build and run. 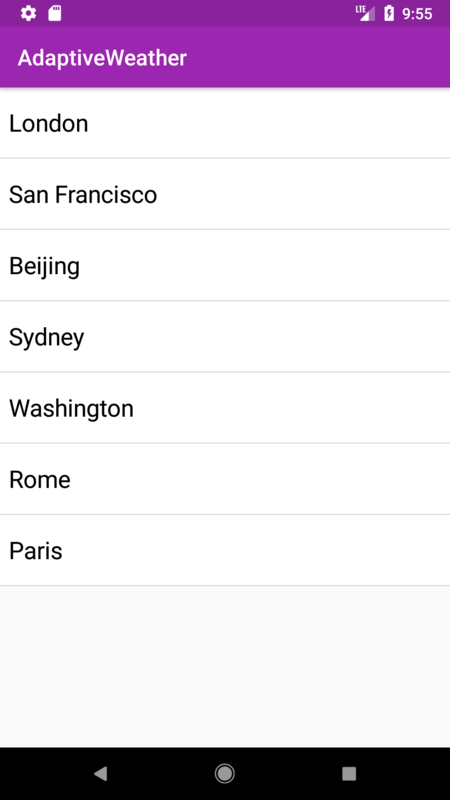 The app displays a simple RecyclerView listing several cities. 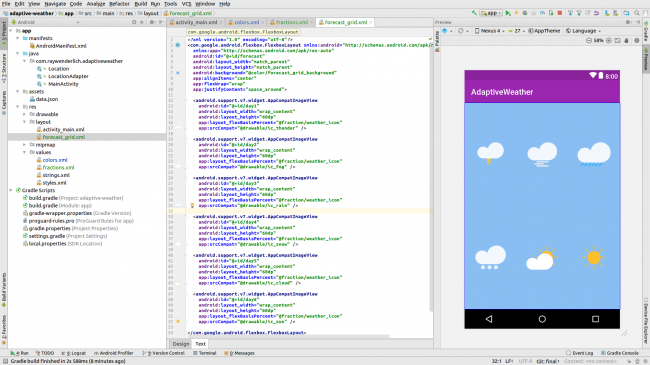 To learn all about RecyclerViews, we recommend reading our Android RecyclerView tutorial. Google’s FlexBox provides an implementation of the FlexBox specification on the Android platform. As you will see later on, it is a very useful tool for designing adaptive layouts. And combining it with Android’s resource qualifier system makes it even more powerful! Note: The Android platform is constantly updated and the version numbers may have increased since we published this tutorial. You can find details of the different versions, including the most recent on the support library pages on the Android developer site. 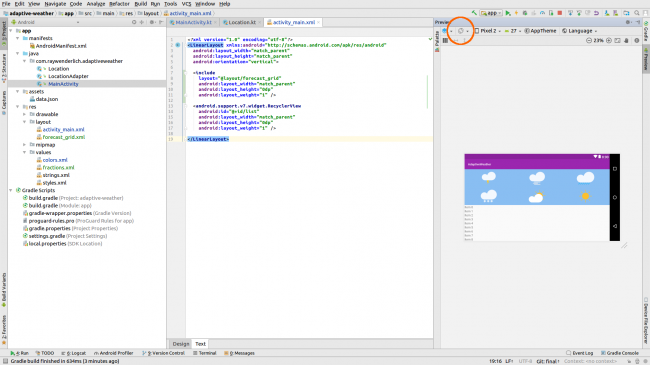 Android mode is the default when working within Android Studio because it provides a clean and simple file structure. Project mode is also necessary for building alternative layouts. Whilst some UI editors make it easy to export images in different sizes, we will be exploring a different approach in this tutorial. 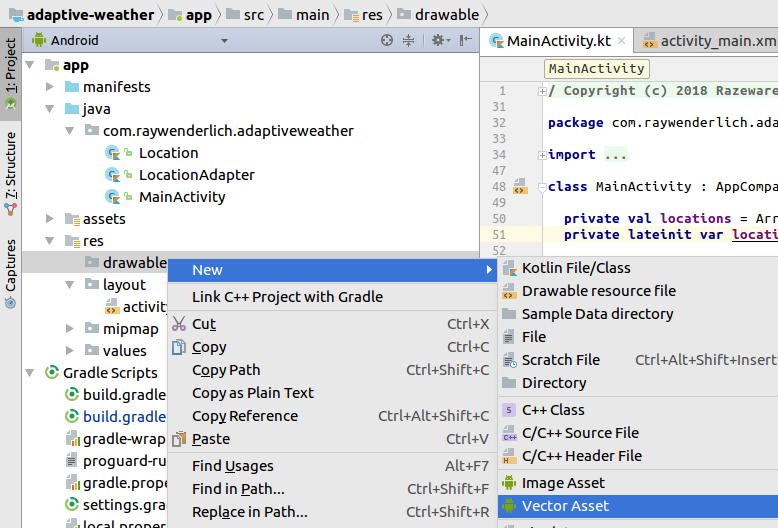 Android Studio recently added support for Vector Drawables. This means that all your assets can be imported once and will be scaled at runtime depending on the device configuration (screen size and orientation). Now you should see your icon in Android Studio as res/drawable/ic_cloud.xml. Repeat the same operations for the other icons: fog, rain, snow, sun, thunder. With scalable assets now in place in the project, you’re ready to start customizing the layouts. With the dependencies declared, you get to shift your focus to building some layouts! This simple application only contains one screen, which is represented by MainActivity. 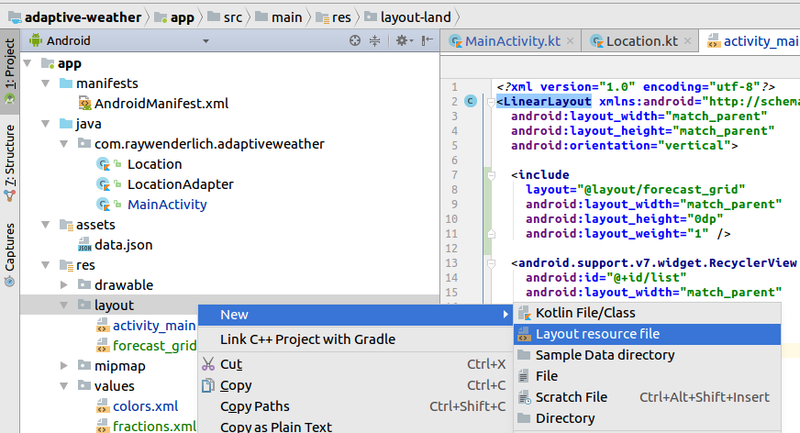 From the Project navigator, open res/layout/activity_main.xml. Click on the Preview button on the right side to see it in action. 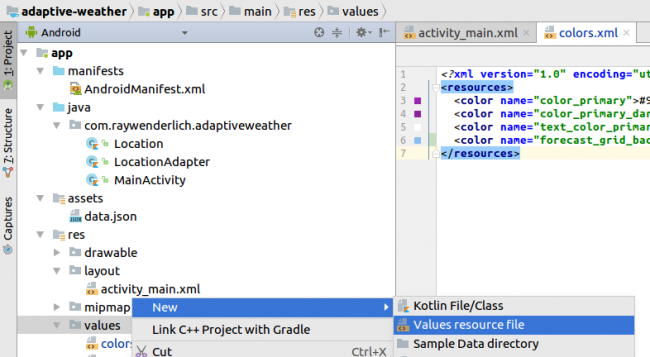 An activity comprises a Kotlin or Java class — in this case MainActivity.kt — and a layout file. In fact, one activity can have several layouts, as you’ll see shortly. For now, it’s important to remember that the existing layout file, activity_main.xml, is the default layout. Here you’re specifying that the width taken by each icon should be 1/3 of the total width. You’re using the com.google.android.flexbox.FlexboxLayout resource to layout the icons on the screen. 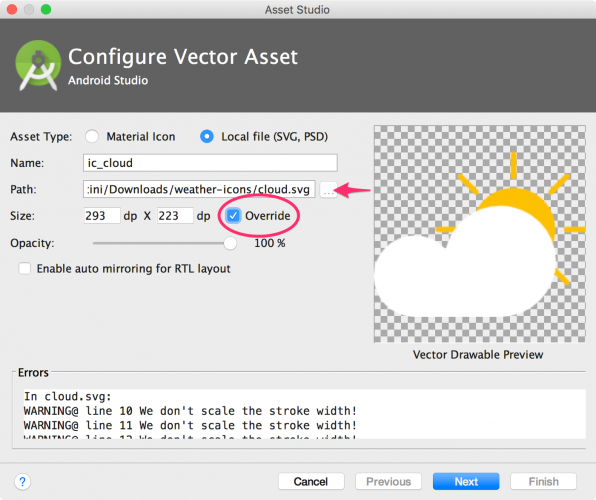 You’re using the android.support.v7.widget.AppCompatImageView resource to draw the weather icons on the screen. You would normally use the ImageView resource with plain images (.png, .jpg) but for Vector Drawables you must use this component instead. 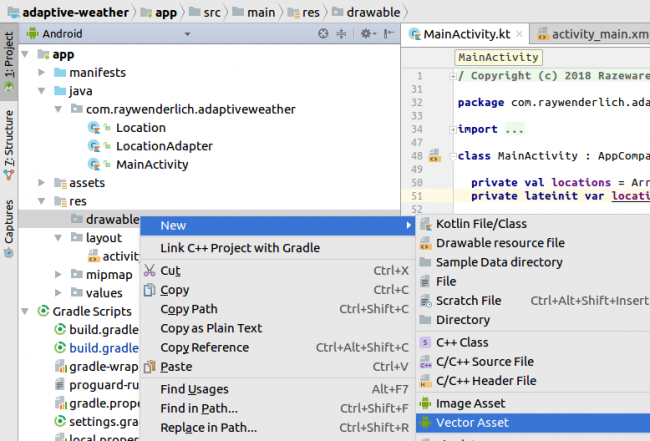 Note: If your Activity/dialog is provided by appcompat from the support library, then the Android system will use an AppCompatImageView under the hood when you specify a regular ImageView in your layout. So, in that case, you could just use a regular ImageView with your vector assets. This is already starting to feel adaptive! Instead of positioning the icons with margins or using a relative layout you have used the FlexBox properties to spread them symmetrically. 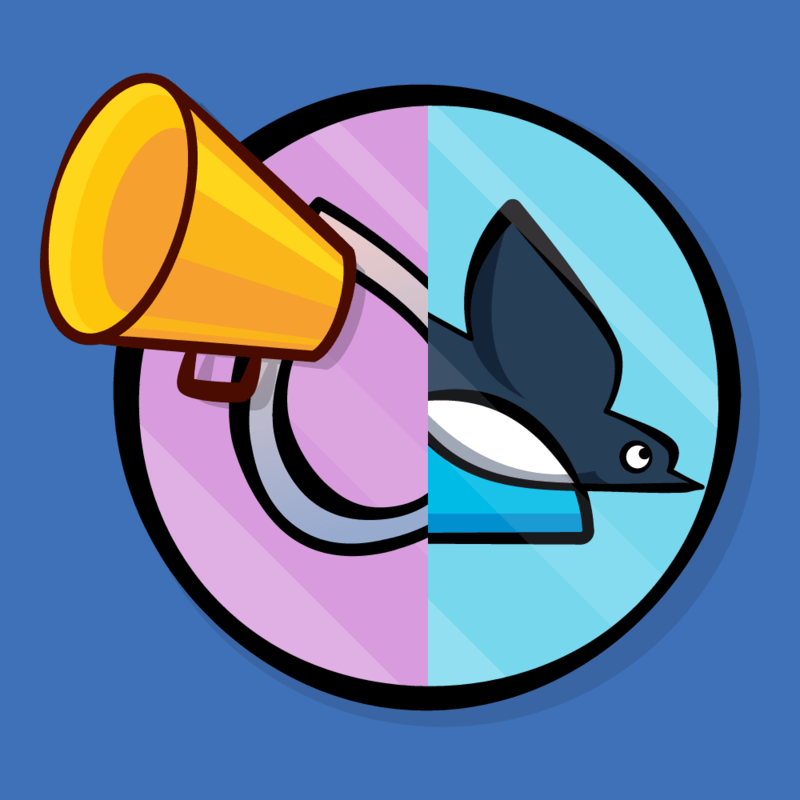 If you remove a middle icon for example, the remaining ones will automatically shift to the left to fill in the empty space. This is the true power of using FlexBox in layouts. The forecast grid is now ready to be used in your default layout for the main activity. Layout reuse: using the include XML tag you’re placing the forecast grid on the top half by referencing the forecast_grid.xml layout. This is one of the core functionalities to creating different layouts without duplicating the code. Notice that the preview in the editor gets instantly updated. At this point you still haven’t deployed the application to a device or emulator which is astonishing. Build and run. You should now see the weather icons above the list of locations. Take a look at the static JSON data in assets/data.json. The forecast for a given location is represented as an array of strings. You could create another RecyclerView with a GridLayout to dynamically create the forecast, but that’s asking for trouble :]. Instead you will write a method that maps each possible forecast value to a corresponding drawable icon. Good job, what a beautiful looking weather application! The weather in San Francisco isn’t looking so beautiful though :]. At this stage, you could run the app on multiple Android devices or simulators. But this method of testing alternative layouts is time consuming and repetitive at best, and error prone at worst. There must be another way. Thankfully, Android Studio has extensive previewing capabilities. Open the default activity_main.xml file, and hover your mouse over the bottom right corner of the screen to resize the layout. 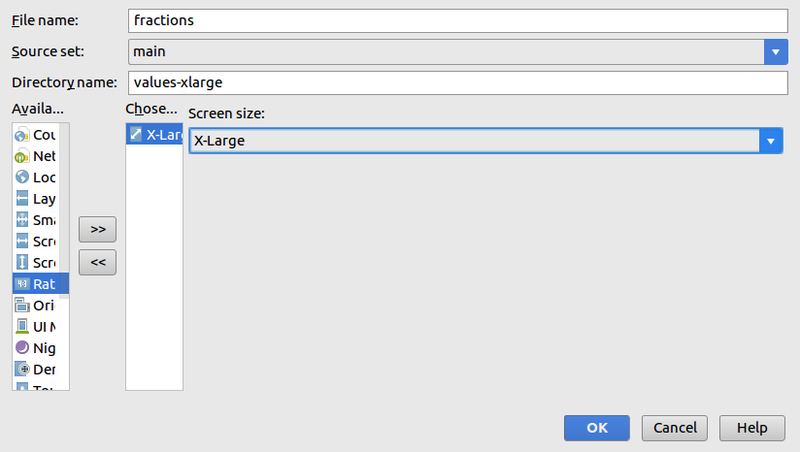 Notice that upon clicking the handle, Android Studio automatically displayed guides for different device sizes. Ugh — landscape mode is none too kind to your design. Let’s try to have both views side by side instead. To tell the system which resource to pick for a given dimension, you place the layout resource in a folder named in a particular way. The system will pick the correct activity layout for the current device’s screen dimensions. This way, you will have adaptive UIs for your app. 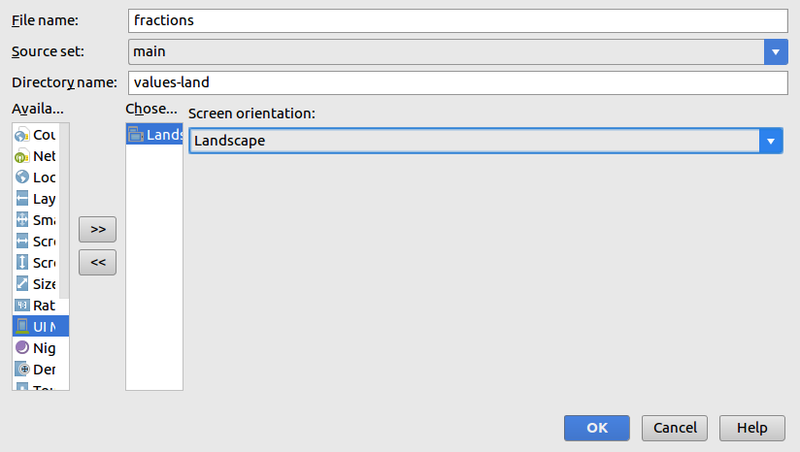 The layout editor now shows a blank screen for the landscape mode because it picked the newly-created layout file layout-land/activity_main.xml. This only contains an empty ConstraintLayout, though not for much longer :]. Add the following to reuse the weather forecast layout and RecyclerView in a horizontal orientation this time. And the layout editor now shows all your elements in landscape orientation. Well done! 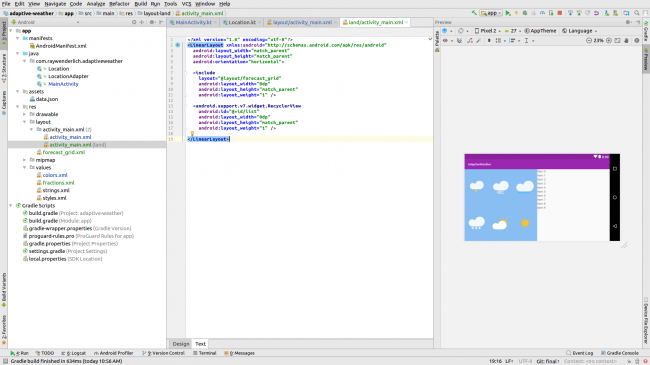 You have created the first layout qualifier in this application. There are layout qualifiers for plenty of other configurations (screen width, height, aspect ratio etc.). In the next section we will modify the landscape layout even further with just a one-line change. The configuration qualifiers can be applied to any attribute type in your XML layout (font size, colors, margins etc.). Return to the portrait orientation in the layout editor and drag the screen size all the way to the X-Large size range. Return to the layout editor and notice that all the weather icons are aligned on 1 row. Don’t worry, the content in this section isn’t as scary as the title makes it sound. When the user interacts with the application, the layout state changes over time (rows are selected, input fields populated with text etc.). When the layout changes (for example when the orientation changes), the existing layout is thrown away a new layout is inflated. But the system has no way of knowing how to restore the state because the two layouts could be completely different as far as it knows. To see a live example of this in action, build and run the application. Select a location then change the orientation and notice the location isn’t selected anymore! 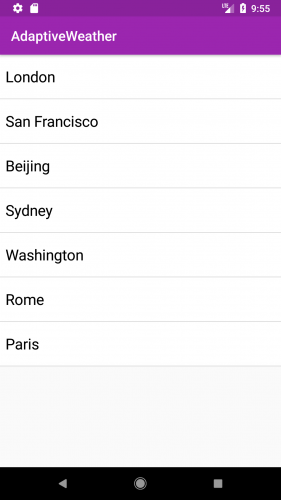 If you are not already surprised that the forecast in London is sunny all week then you may also notice that the selected row was deselected after switching to landscape. To fix this, you will hook into the activity lifecycle methods to save the selected location to a bundle and retrieve after the screen rotation. private const val SELECTED_LOCATION_INDEX = "selectedLocationIndex"
Build and run again and this time the location remains selected across configuration changes. Hooray! Well done! You’ve built your first Android app with adaptive layouts and you learned how activities can make use of multiple layouts. 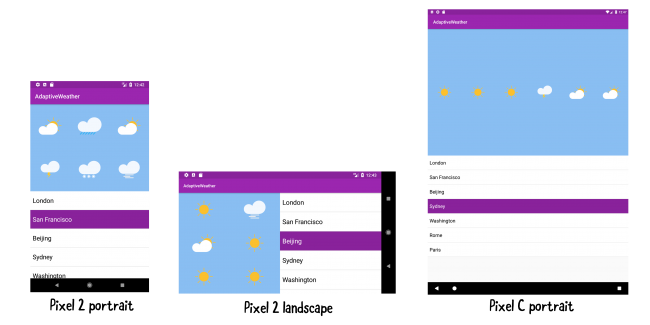 You learned how drawables work with different displays, and how to make your app come to life on practically any Android device. Use another available qualifier to have yet another type of layout. For example, what if you'd like to have a different background color based on the locale qualifier? Or, try using size qualifier on other resources, such as strings. You could add a TextView which shows a short message, or a longer message with the same name if the screen is in landscape? 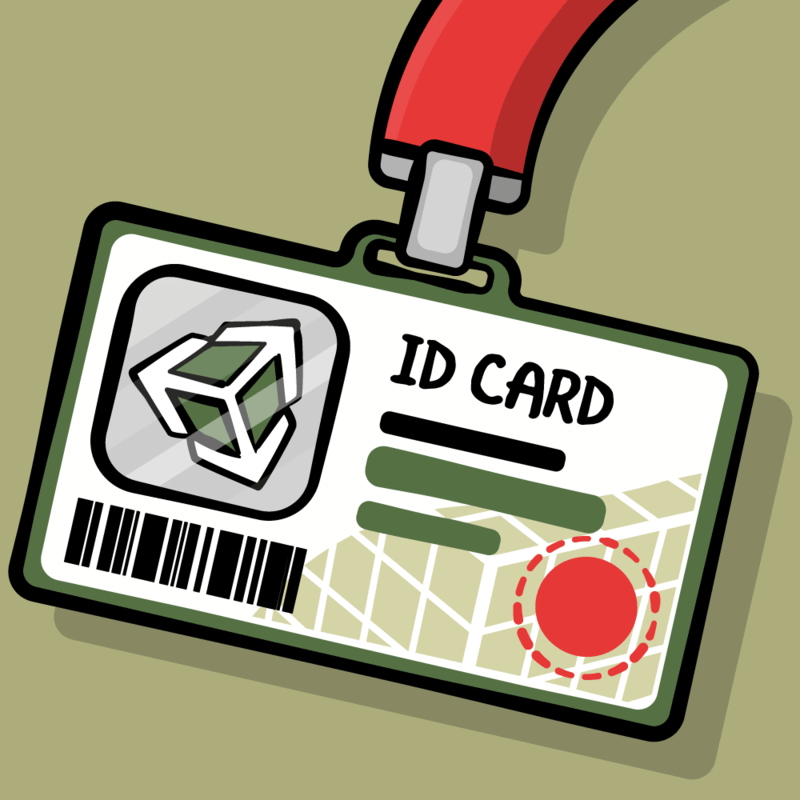 Get the full source code for this project as a downloadable zip. Feel free to share your feedback, findings or ask any questions in the comments below or in the forums. Talk to you soon!